There are many annoying issues associated with desktop 3D printers, but perhaps none are trickier than keeping the machine at the proper temperature. Too cold, and printed parts can warp or fail to adhere to the bed. Too hot, and the filament can get soft and jam, or the motors will start clanking and missing steps. High-end industrial 3D printers have temperature-controlled enclosures for precisely this reason, but the best you can hope for with a printer that’s little more than some aluminum extrusion and an Arduino is a heated bed that helps but is no substitute for the real thing. Like many 3D printer owners chasing perfect prints, [Stephen Thone] ended up putting his machine into a DIY enclosure to help keep it warm. Unfortunately, there gets to be a point when things get a little too hot inside the insulating cube. 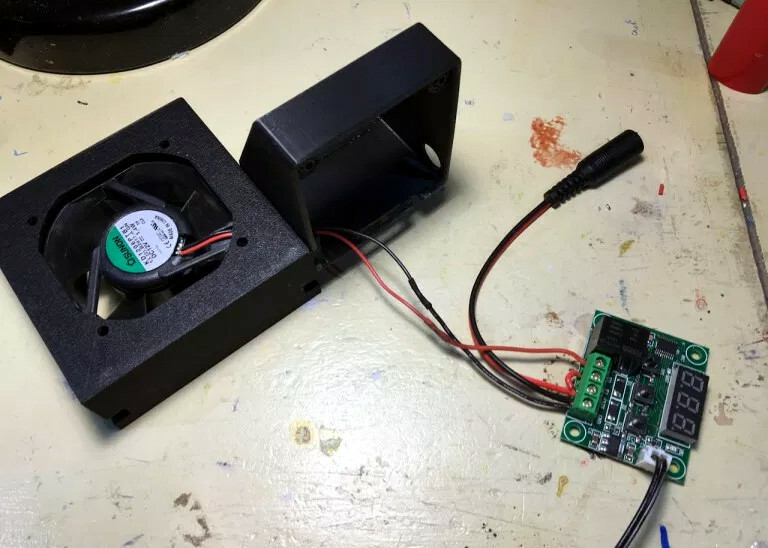 To address this issue, he put together a simple but very elegant temperature controlled fan to vent the enclosure when the internal conditions go above the optimal temperature. [Stephen] picked up the digital temperature controller on Amazon for about $4 USD, and found a 60mm fan in the parts bin. He then came up with a clever two-part printed enclosure that slides together to make the fan and controller one unit which he can place in a hole he cut in the enclosure. A lot of attention was paid to the front panel of the device, including mid-print filament swaps to create highlighted text and separate buttons printed in different colors. The end result is a very professional looking interface that involved relatively little manual labor; often a problem when trying to come up with nice looking panels. Whether it’s to keep from breathing ABS fumes, or to quiet the thing down enough so you can get some sleep, it looks like an enclosure of some type is becoming the latest must-have 3D printer accessory. Trouble is, most dust-management designs just don’t get the job done, or if they do, they obstruct your view of the tool with a brush or other flexible shroud. [Jeremy Cook] figured he could do better with this coaxial dust collector, and from the practically dust-free cuts at the end of the video below, we think he’s right. The design is a two-piece, 3D-printed affair, with a collar that attaches to the spindle and a separate piece containing the duct. The two pieces stick together with magnets, which also lets the shroud swivel around for optimal placement. The duct surrounds the collet and tool and has a shop vac hose connection. In use, the vacuum pulls a ton of air through small opening, resulting in zero dust. It also results in the occasional part sucked up from the bed, so watch out for that. [Jeremy] has published the STL files if you want to make your own. We’re pretty impressed, but if you still feel the need for a physical shroud, check out this shaggy-dog design that seems to work well too. Or you could just throw the whole thing in an enclosure. What good is safety gear that isn’t used because it’s annoying and gets in the way of getting the job at hand completed? None, really, and the solder fume extractor is one item that never seems to live in harmony with your workspace. They’re often noisy, they obstruct your vision, and a power cord draped across your bench is a sure way to ruin your soldering zen. To fix those problems, [Nate] has built a nice battery powered solder fume extractor that’s so low profile and so quiet, you won’t mind sharing a bench with it. Based on a standard 80-mm case fan, the extractor has a built-in 18650 battery for power and a USB charging port. There are nice little features, like a speed control and a low-battery indicator. The fan mounts to a pair of custom PCBs, which form the feet for the fan. [Nate] claims to have run the fan for 12 hours straight on battery before needing a charge, and that it’s so quiet he needs to add a power indicator to the next version. Also making an appearance in rev 2 will be a carbon filter to catch the fumes, but as [Nate] notes, better to spread them around for now than let them go directly up his nose. Are you in the hacking arts for the long haul? Let’s hope so. If you are, make sure you’re up on the basics of mitigating inhalation hazards. A lot of work has gone into hacking common items (like IKEA Lack tables) into useful and effective 3D printer enclosures, but [Stefan.Lu] has taken a harder look at the whole business. He decided to start with some specific goals that were unmet by current solutions. In particular, he wanted to allow for proper ventilation and exhaust. Not only do some filaments smell bad, but there is ongoing research around UFP (ultra-fine particles) emitted from the 3D printing process. Just in case UFPs turn out to be this generation’s asbestos or something equally terrible, [Stefan.Lu] felt that a bit more work and expense up front would be worth it to meet his goals of a ventilation-friendly enclosure. In addition to ventilation and exhaust, [Stefan.Lu] wanted to locate the printer at a comfortable working height, and preferred not to build things entirely from scratch. He did it for well under $200 by using a common storage rack shelf as the foundation and acrylic panels for the sides, and a few thoughtful uses of basic hardware. The angled metal supports made for easy attachment points and customization, and a combination of solid shelf plus anchoring to the wall put an end to vibrations. The side panels are secured by magnets, and [Stefan.Lu] points out that if you don’t have access to a laser cutter, cast acrylic withstands drilling and cutting better than extruded acrylic. The final touch was a fire alarm, which is an excellent precaution. 3D printers are heating elements with multiple moving parts and they often work unattended. It makes sense to have a fire alarm around, or at least not enclose the device in highly flammable material in the first place. [Frank Howarth] has a shop most woodworkers would kill for, stuffed with enough tools to equip multiple hackspaces — four radial-arm saws alone! But while the CNC router in the middle of the shop, large enough to work on an entire sheet of plywood, is a gem of a machine, it was proving to be a dusty nightmare. [Frank]’s solution was as unique as his workspace — this swiveling overhead dust extraction system. The two-part video below shows how he dealt with the dual problems of collection and removal. The former was a fairly simple brush-bristle shroud of the type we’ve featured before. The latter was a challenge in that the size of the router’s bed — currently 8′ but soon to be extended to 12′ — and the diameter of the hoses needed to move enough air made a fixed overhead feed impractical. [Frank]’s solution is an overhead trolley to support the hoses more or less vertically over the router while letting the duct swivel as the gantry moves around the work surface. There were a few pitfalls along the way, like hoses that shorten and stiffen when air flows through them, but in the end the system works great. Chances are your shop is smaller than [Frank]’s, but you still need to control the dust. This dust collector for a more modest CNC router might help, as would this DIY cyclonic chip separator. As if slinging around 40 watts of potentially tattoo-removing or retina-singeing laser beams wasn’t anxiety-inducing enough, now comes a new, scary acronym – LCAGs, or “laser-generated airborne contaminants.” With something that scary floating around your shop, it might be a good idea to build a souped-up laser cutter exhaust fan to save your lungs. We jest, but taking care of yourself is the responsible way to have a long and fruitful hacking career, and while [patternmusic]’s “Fume Coffin” might seem like overkill, can you go too far to protect your lungs? Plywood and acrylic, the most common materials that come across a laser cutter’s bed, both release quite a witch’s brew of toxins when vaporized by a laser beam. The Fume Coffin clears the air in your shop by venting it to the outdoors after giving it a good scrubbing through an activated charcoal pre-filter and a HEPA polishing element. Both filters are commercially available so replacements won’t be an issue, and the entire thing is housed in a wooden box that gives the device its name. Since it’s ejecting 200 cubic feet per minute, you’ll have to provide at least that much make-up air, but other than that the Fume Coffin should be a welcome addition to the shop. We’ve seen a few other attempts to handle LCAGs effectively before, including a DIY charcoal and automotive air filter design. Don’t you just hate it when you spend less than $400 on a 40-watt laser cutter and it turns out to have a work area the size of a sheet of copy paper? [Kostas Filosofou] sure did, but rather than stick with that limited work envelope, he modified his cheap K40 laser cutter so it has almost five times the original space. The K40 doesn’t make any pretenses — it’s a cheap laser cutter and engraver from China. But with new units going for $344 on eBay now, it’s almost a no-brainer. Even with its limitations, you’re still getting a 40-watt CO2 laser and decent motion control hardware to play with. [Kostas] began the embiggening by removing the high-voltage power supply from its original space-hogging home to the right of the work area. With that living in a new outboard enclosure, a new X-Y gantry of extruded aluminum rails and 3D-printed parts was built, and a better exhaust fan was installed. Custom mirror assemblies were turned, better fans were added to the radiator, and oh yeah — he added a Z-axis to the bed too. We’re sure [Kostas] ran the tab up a little on this build, but when you’re spending so little to start with, it’s easy to get carried away. Speaking of which, if you feel the need for an even bigger cutter, an enormous 100-watt unit might be more your style.